Workers’ productivity can be affected due to dirty and unhealthy work environment. They may not be too bothered about workplace hygiene, but dirtiness affects their mood and makes them less productive and distracted. Clean environment makes them feel energetic and happy. Well lit and bright work places make workers more creative and organised, as they feel happy and enjoy the work. Nobody likes to work in a dirty environment and windows play a major role to keep the work environment tidy. Not only they allow abundant light inside the room, they also make the space look clean and fresh. Clear and see-through windows indicate how much you care for your customers. Your windows show your seriousness in business. Customer will hesitate to enter your business area if the windows are untidy. You should engage a reliable commercial window cleaning service to remain ahead of your competitors. Green Smart Technical is the pioneer in window cleaning service in UAE and their large customer base is the testimony to their customer-friendly and sustainable services. Green Smart Technical understands that clean and neat windows not only represent your business but also your professionalism and personality. They have a set of highly qualified professionals who can undertake any tedious task of window cleanings on dangerous peaks using most reliable and safe ‘rope access’ technology. These engineers and technicians have handled many such projects, capable of managing any new challenges and can complete the work within the stipulated period. 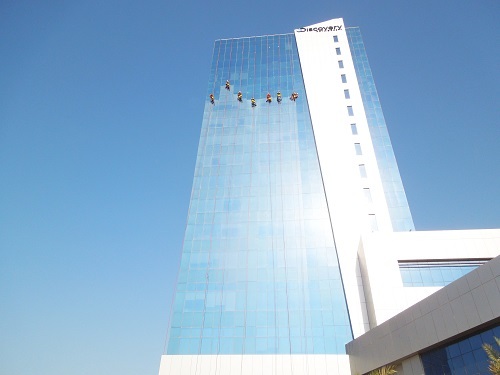 For any kind of window cleaning and maintenance services, Green Smart Technical staff use rope access technique, they ensure seamless and high-quality completion of works under the agreed budget without disturbing the immediate environment and peace of the incumbents. Besides, the cleaning service uses high-standard chemical agents which don’t make any impact on the environment, hence making the services offered sustainable, cost-effective and safe.